A couple of years ago I started running, and as it turned out it became my way of connecting with the Universe. It’s one of the ways I feel fully alive, summertime or not. Through running I’ve met some really wonderful and inspiring people, and I asked one such person to share her story here because she embodies being fully alive on a daily basis. An important part of being fully alive is to remember that you’re actually alive. And that’s what Carol Dellinger did when she was … well, I’ll just let her tell you her story … she’s freaking amazing. It was October 2009, I had just completed running my 233rd marathon when I was diagnosed with Stage 2 Ductal Carcinoma Breast Cancer. But how could it be me? I was fit, healthy, didn’t smoke or drink and ran 35 miles a week? The cancer was so extensive in my right breast I had to have a mastectomy of my right breast. But I decided to hit this disease head on like a new marathon to run…..no pity party for me, cancer had picked the wrong woman to mess with! Two days after my diagnosis and one week prior to surgery, I ran my 234th marathon. My way of saying that I can beat this cancer thing, I am a fit and powerful woman! It was an emotional marathon, because I was not sure what my future would be. After extensive surgery, I crossed the finish line of my comeback marathon nine weeks post mastectomy! I have since run 33 more marathons in the last 36 months, bringing my total to 268! An amazing feat for any runner, let alone someone going through breast cancer. Surviving cancer has taught me so many lessons. I don’t sweat the small stuff anymore, and I take the time to enjoy each and every person I come in contact with each day. And you truly find out who your real friends are, for some reason when you get diagnosed with cancer, some friends seem to think you might be contagious or something, they quickly distance themselves from you. Since going through breast cancer, I have nurtured my true friendships and deleted all of the negative friends out of my life! I compare it to hitting the Delete button on your keyboard! I have deleted and excused all of the negativity out of my life. You soon realize who just wants to take advantage of you. I have devoted my life and running career to spreading the message that challenges can be overcome with the right attitude and surrounding yourself with positive, like-minded people. I cherish each and every moment of my day and realize that since I overcame the challenge of having breast cancer, I can overcome any day to day challenge. I believe I can do the ordinary things better than anyone else. Cancer didn’t win this battle, I won this battle! I am alive and can’t wait to live the rest of my life and reach my goal of 500 marathons! 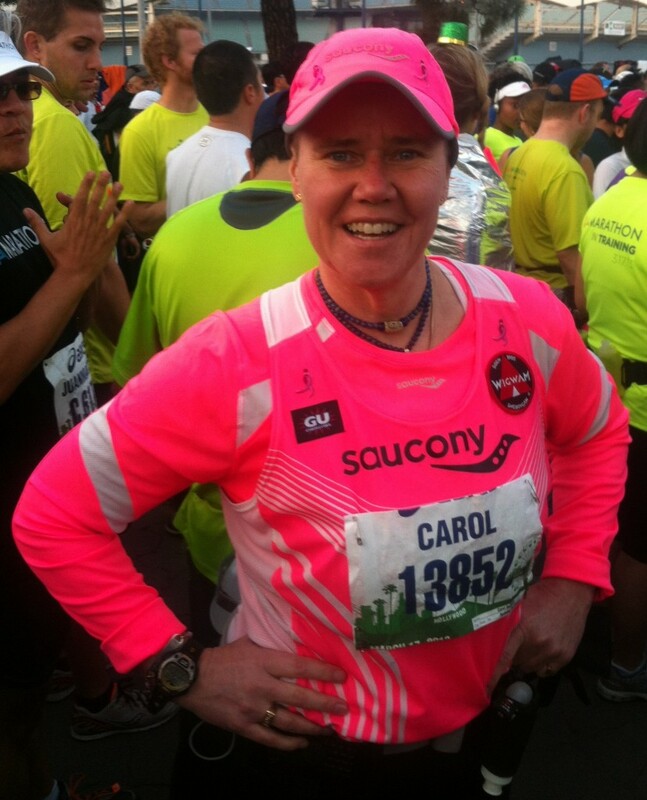 Carol Dellinger is a Warrior Marathon Runner, finisher of 270+ marathons, 3 year breast cancer survivor, and motivational speaker. You can visit her website at www.warriormarathonrunner.com, and she can be found on Facebook as Carol Dellinger and Warrior Marathon Runner. Part of the Summer of Authenticity: Fully Alive! series, now available as a free eBook! 500 marathons? I’m need a nap just thinking about it;) Seriously, though: a standing ovation for you and your slogan – not just the words, of course, but the way you embody it.